A new addition to Alaska's backcountry shelter hut system rose up this week between rugged mountain peaks in a remote part of Hatcher Pass north of Anchorage. The Seth Holden Hut is the area's fifth such hut. It's the first built by the nonprofit Mountaineering Club of Alaska in more than two decades. 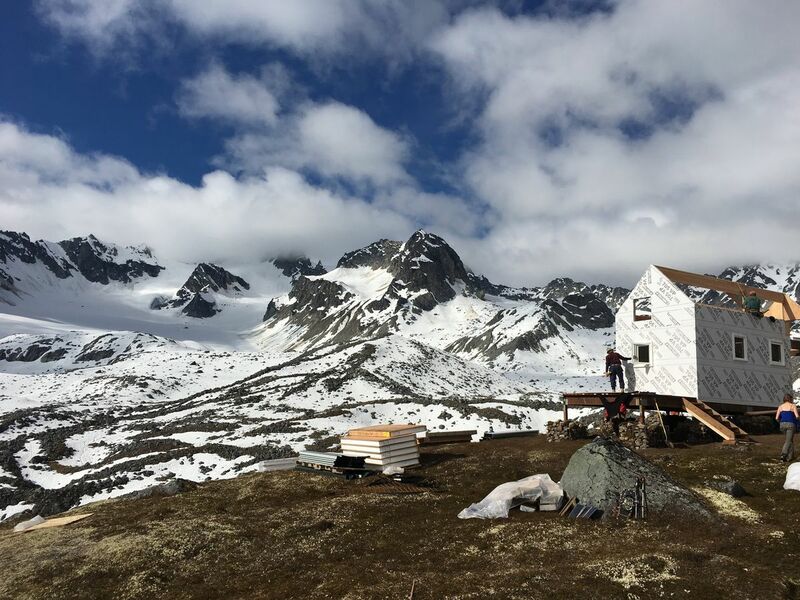 The hut allows experienced hikers or skiers to complete a 50-mile hut-hopping tour of dramatic, glacier-carved terrain in Hatcher Pass. The hut is named after Seth Holden, a 29-year-old Alaska climber who died in a plane crash. His father, Pete Holden, a carpenter, was part of the volunteer work crew that arrived at the construction site in late June. The effort fits into longstanding mountaineering traditions in Alaska. Small shelters, cocooned in between peaks and glaciers, have served as base camps, safe havens and warm-up spots for adventurous climbers and skiers for decades. The Mountaineering Club of Alaska built its first hut in 1964 as an access point to Eklutna Glacier. Two more huts, part of the Eklutna Traverse, were built in 1968. In 1971, the club built its first hut in Hatcher Pass: The Mint Hut, a popular and relatively easy-to-access hut at the headwaters of the Little Susitna River. Two decades passed. Then came another burst of construction activity. The Hatcher Pass hut network grew with the construction of the Bomber Hut, in 1990, and the Dnigi Hut, in 1995. A fourth hut just to the west, the Snowbird Hut, has existed in some form since 1985 and was rebuilt in 2010 by the American Alpine Club. Huts have been built in heavy rain, wind and, earlier on, with materials thrown from fixed-wing aircraft with parachutes. In recent years, members of the mountaineering club wanted a new place to explore, said Cory Hinds, an Anchorage engineer and former club president. A mountain guide, David Staeheli, did some reconnaissance in the Hatcher Pass mountains. 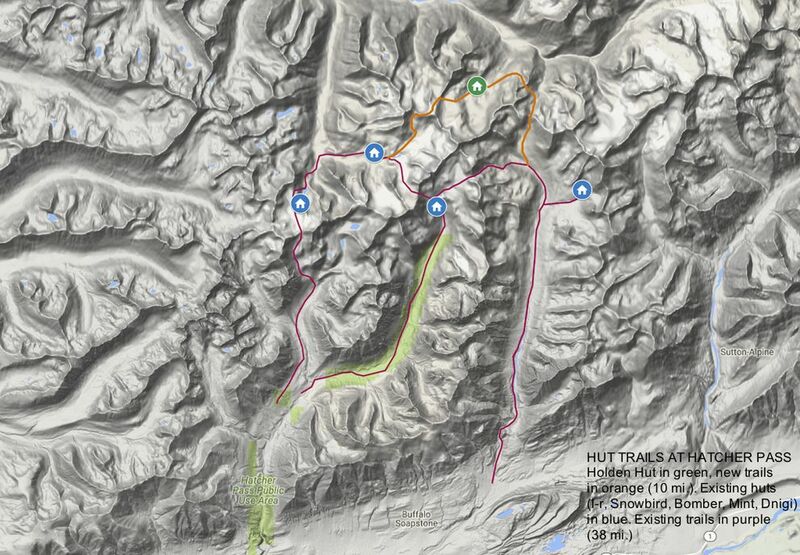 Staeheli picked out a spot for a new hut: A side valley between the Mint and Bomber Huts. The site is on a south-facing slope on a knoll next to tundra and lakes that drain into a river. "It is startlingly beautiful," Hinds said. Hinds said the club had decided to build a new hut and was drawing up designs when the family of Seth Holden approached them. Holden, a well-regarded climber, died in a plane crash on a sandbar along the Susitna River in 2010. The family asked if the club had any projects that could be supported as a way to honor Seth's legacy, Hinds said. With a large boost from the Holden family, the club raised about $45,000 to build the hut, a far larger budget than any other hut in the past, Hinds said. The extra funding allowed the club to buy materials for a more advanced insulation system. The club secured a 10-year lease from the Alaska Department of Natural Resources for the property, with an annual fee of $530. Construction started June 26. Hinds hiked out the day before. The crew ranged from 10 to 13 members. About half flew in via helicopter and the other half hiked. The Gold Mint Trailhead, near the mouth of Hatcher Pass, served as the staging area for gear. In all, it took 11 helicopter trips to deliver all the equipment, Hinds said. The crew set up camp and settled in. The average age of the crew was 55, Hinds said. The group had breakfast at 7 a.m., took a break for lunch, and sometimes worked up until an 8 p.m. dinner. Tom Choate, who in 2013 became the oldest man to summit Denali at the age of 78, was there. He read his favorite Robert Service poems aloud to the group after dinner. By Thursday, there were only a few finishing details left, like hanging the door and putting in the stove, Hinds said. The hut was expected to be finished by the end of the weekend. The 10-by-24-foot wood structure has insulated panels, a kerosene stove, an outhouse and a big loft that can easily sleep between 10 and 12 people, Hinds said. Hinds hiked out Wednesday, nine days after he arrived. It took Hinds, an experienced hiker, about 10 hours to get to the Reed Lakes trailhead through Bomber Pass. In general, the journey to the new hut is best attempted by experienced backcountry travelers or skiers who are familiar with glacier travel and avalanche terrain. Snowshoes are highly recommended, Hinds said. The hut is open to the public, though the club suggests visitors buy a $20 membership, with the money going toward maintenance. There are no reservations — the hut is first-come, first-serve. For the people who make it there, it's a source of deep connections, Hinds said. "The friends you meet in the huts…it's an intense experience," Hinds said.